Did my title surprise you? Tonight's tea cup is in the corset shape. and the first shape I learned to recognize. and silver and gold leaves. I am not sure of her color as she changes in the light. I am all excited as the books I ordered came in! and it is very good....And very colorful! Perfect as it is all outside my comfort zone. and my newly begun bold paintings! wonderful classes, that I am deep in it! I love to "see" YOU! and that your wild weather has abated. I will be visiting all the tea cup parties I can this week. Then come back here and link that specific post up below. Such a pretty teacup Terri! I will go and check out your Pinterest board. Gorgeous tea cup Terri.... I love how it is plain on the outside and then has the sweet flowers on the inside. Such a wonderful shape too. Good luck with your classes.... I am a fan of Flora! Can't wait to see what you get up too! ps No damage at mine thank you but it is so sad to see all the local flooding. Mmm a beautifully shaped tea cup Terri! I love the soft green colour too. Hello Terri! It's me again and...yes, again with some children's china, you already know I'm a little obsessed with the topic...haha. I really love your teacup, your first photo is gorgeous! It's so elegant, and your photos, as always, really a pleasure. Good luck with your courses! Terri, your teacup today is really beautiful! I have one much like it only she's turqoise, also in the corset shape. It is one of my favourites too. Thank you for sharing and have a lovely day. Lovely tea cup. I always think of that shape as being quite elegant! Like dresses of the Edwardian era. What better place for tea than the art room. It is a lovely soothing thing, especially when you are venturing outside your comfort zone. I am so glad you are lost in the moment! There is nothing quite like it, being caught up in the paint, and the thoughts, and /or just whatever is happening right then! Love ya! Simply lovely! I love the pretty green and pink together - so feminine and elegant :) Happy Tuesday! 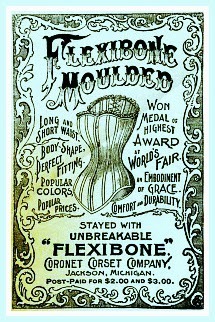 Thanks for hosting Terri, and I will remember the corset teacup shape from your pretty example. Glad I don't have to wear a corset, I cringe when I see them doing one up on Downton Abbey. 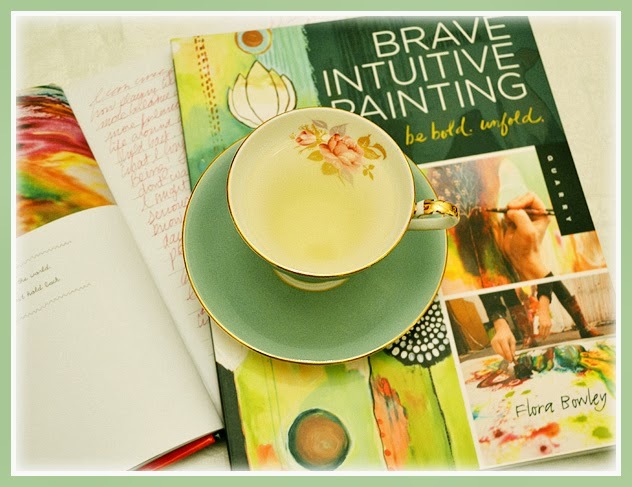 Have fun with your art classes, and don't forget to stop for tea now and then. I love the color of your tea-cup! What a lovely cup. I love the simple shape with the pretty roses peeking out. Have fun with your classes. I've watched one of Flora's videos and she's amazing. Can't wait to see what you create! What a beautiful cup and gorgeous color..love the corset shape! 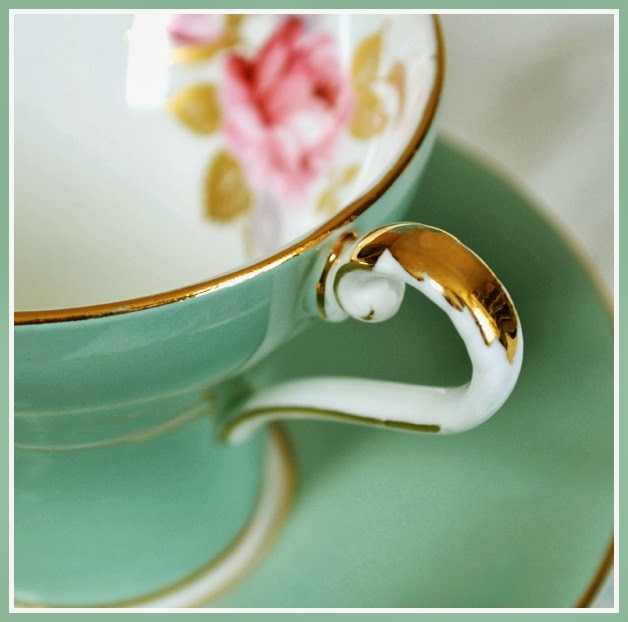 I have learned so much about tea cups because of you...and I am so appreciative.! Yay..enjoy the class ..sounds divine..I know you will enjoy it..you are so talented! 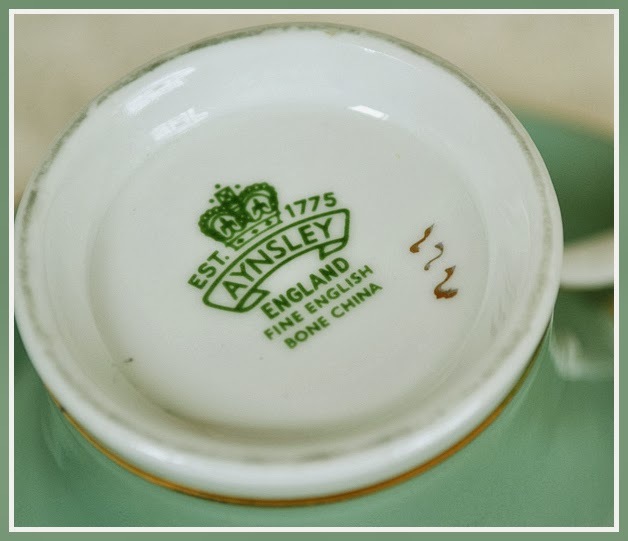 What a beautiful tea cup, such a pretty shape. I haven't really thought about how tea cups are described, but it certainly fits :-) Have fun with your classes. Pretty teacup! I think it's wonderful you are taking an art class. I love learning new things, too. sounds like you are really enjoying it. On my link to your party today, there is a picture of another blogger right above the title to my post. I am unable to delete it or change it. Are you able to remove it for me?? Hi Terri, I think it's just wonderful that you've found an inspirational class. I'd love to see more of your art and so hope you'll share your new painting experience. The tea cup looks lovely and I never thought of it as a corset shape, but of course it is exactly what that is! :) Big hugs and hope you enjoy your class and the week. Very funny- a corset shaped teacup. It is a sweet one with a pretty color. Hi Terri, I enjoyed getting caught up on your blog. All are lovely! 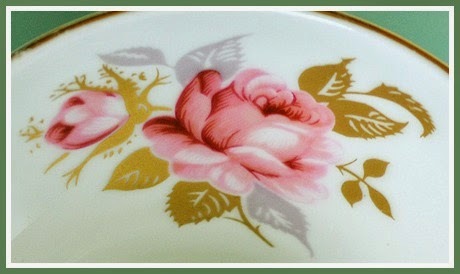 I especially love the pink tea cup in the post below... and the chintz one is just adorable! Chintz was always my grandmother's favorite. I hope you're having a wonderful day. Hi Terri! I LOVE that tea cup. Everything about it is beautiful. The shape, the color, etc. So happy to hear you're doing the other classes. I think it's wonderful to discover and use all the talents we have...maybe hiding...inside us! I think of you often. Please stop by my blog, too, when you get the chance. Big Hugs! this is such a beautiful teacup!! 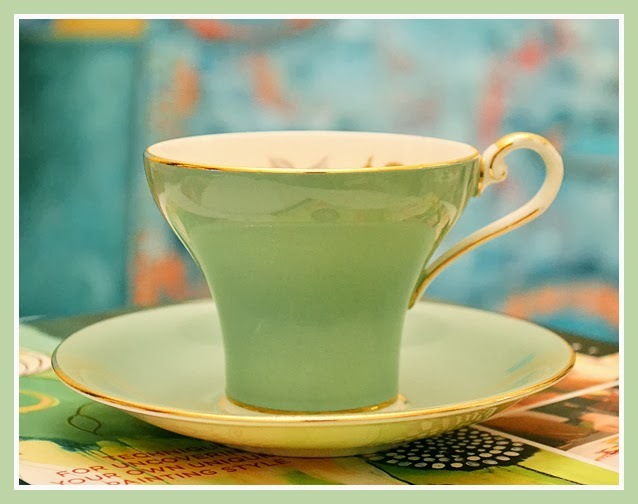 Really awesome tea cup .I liked its colors and shapes.Both tea cup pictures are excellent.I am eager to seeing your next article in the next future.